made by my sister and I. So me and my sister were bored and we decided to bake a cake. Now the baking went really well. Until it decided to completely fall apart. So we tried our best to patch it up with the frosting that we were putting on it. The result? Me making a complete mess, and ending up doing the whole thing by myself. I mananged to piece it back together quite nicely don’t you think? Well after we had the breaking disaster, we got to frosting the rest of the cake and that’s why it’s such as train wreck because we’ve never frosted a cake before. After we finished making the chocolate cake green, we decided to split up the cake and each decorate a half of the cake. The result is what you see next to this text. My half is the one that you see with the sign of the Deathly Hallows, the orange pawprint (meant to represent Crookshanks’ paw), and a few other things. So what do you think? 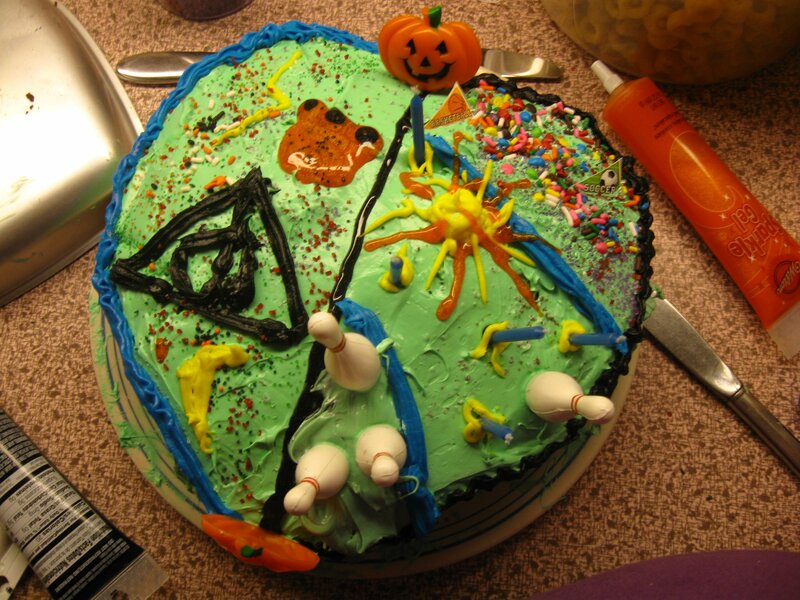 Got any pics of cakes that you’ve made yourself? If so I say you post them in the comments if you can, or maybe just make a link to a pic.